Costa Rica’s renewable energy streak is still going, but what does that really mean? Costa Rica is kicking off Earth Day with a bit of good news: so far the country has generated all of its electricity for the year without burning fossil fuels. The Costa Rican Electricity Institute (ICE) first made this announcement in March when it hit 75 days using only renewable power sources — a record for any country. The news quickly went viral and circulated all over the world. The clean energy streak is likely to continue. Last Friday ICE released a report estimating that 97 percent of the country’s electricity will be produced from renewables this year. This is good news for Costa Rican residents, who will see their electricity prices drop up to 15 percent starting this month. But despite the excitement, statistics from the Environment Ministry (MINAE) show that this achievement does little to reduce the country’s overall reliance on fossil fuels, the vast majority of which are used for transportation. Still, conservation groups and renewable energy proponents say the positive attention can go a long way. How did the country break this world record? And what needs to happen for the country to succeed in reaching carbon neutrality? First, you have to look at the country’s history with hydropower. Despite the deluge of international headlines about Costa Rica’s clean energy, the 75-day milestone is not surprising to anyone familiar with the country’s electricity matrix. From the beginning, ICE’s goal was to create a system that could provide enough electricity for the entire country. The best way to do this, given Costa Rica’s abundant natural resources, was through hydroelectric dams. Costa Rica now generates around 80 percent of its electricity using hydropower, about 15 percent using geothermal energy and a smaller fraction using wind and solar power. Utilities cover the remaining demand by burning bunker fuel, which is both costly and dirty. In a typical year, Costa Rica is able to produce 90 percent of its electricity without burning fossil fuels, but the last several years have been unusual. In 2012 and 2013 Costa Rica was hit with the most intense drought in years and ICE was forced to turn on its bunker generators more frequently to compensate for the drop in available hydroelectricity. The end of 2014 saw weather patterns shift in the other direction, and unusually heavy rainfall bolstered Costa Rica’s water reservoirs enough to produce ample power for the whole country. Climate change specialists say these constantly-changing rain patterns are only likely to increase with global warming, making hydropower more unreliable. 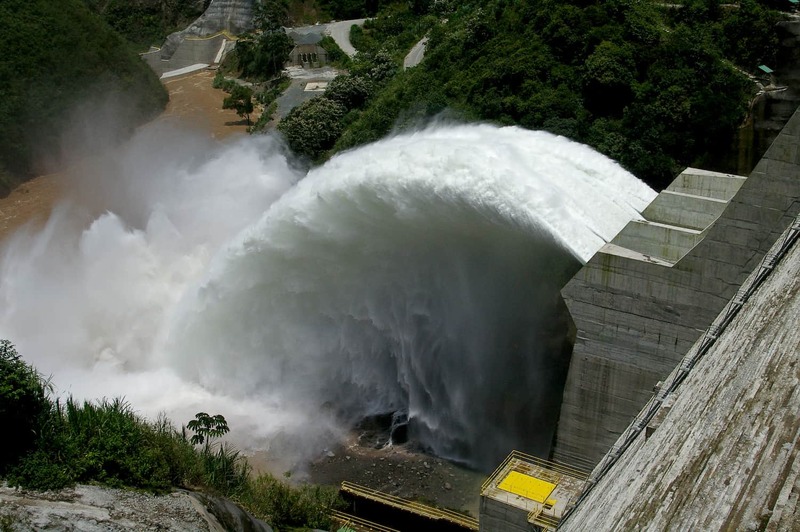 But Gutiérrez says Costa Rica has a solution to these unpredictable rain patterns: more dams. The Reventazón hydroelectric plant, located on the river of the same name in the Caribbean community of Siquirres, is scheduled to become operational next year. It will be the largest dam in Central America. According to Gutiérrez, the Reventazón dam’s location is also advantageous. The Caribbean’s rain patterns tend to be the opposite of the rest of the country, meaning that when there is too little rain to generate power on one side of Costa Rica, the dams on the other side can pick up the slack. Additional geothermal plants and biomass power generators are also in the works to generate more clean energy. But even some supposedly clean power is debated in Costa Rica. A planned geothermal energy plant in Rincón de la Vieja National Park has conservationists split over the value of the renewable energy compared to the destruction of some the area’s pristine wilderness in order to build the plant. Similar debates are being waged worldwide over hydroelectric dams, which often damage rivers and displace people and wildlife. Studies have shown that the Reventazón dam cuts through one of the country’s most important biological corridors. Even putting these issues aside, Costa Rica still has a long way to go before it can call itself fossil fuel-free. In 2010 Costa Rica’s then-President Oscar Arias set a goal for the country to become carbon neutral by 2021. In the five years since the goal was set, the country has made progress in terms of reforestation, renewable energy and environmental mitigation in the business and agriculture sectors. But before Costa Rica can even dream of reaching this goal, it has to address its biggest source of pollution: transportation. Vehicles consume a whopping 70 percent of all petroleum consumed in Costa Rica, and account for 40 percent of the country’s total carbon emissions. Diesel buses are the primary mode of public transportation. And according to Costa Rican customs authorities, there are only about 200 hybrid cars roving the country’s streets. Despite benchmark goals to convert 20 to 25 percent of the country’s buses and taxis to electric vehicles, the programs laid out by the previous administration to get there were a complete flop. One 11-month program designed to encourage taxi drivers to switch to hybrid cars pulled in only 10 participants. Still, taxis and buses are just minor contributors to Costa Rica’s vehicle pollution problem. According to Gutiérrez, more than 50 percent of Costa Rica’s cars are more than 20-years-old with high-polluting engines. To address the issue, MINAE has rolled out a new clunker buy back program with financing options for drivers willing to trade in their old car for a more efficient model. Gutiérrez said the program has already financed more than 50 cars. But replacing old cars with new ones still keeps cars on the road, and both MINAE and conservation groups agree the real way to cut car emissions is to improve public transportation. President Luis Guillermo Solís agrees. Back in September during a speech at the U.N. Climate Summit, Solís affirmed the country’s carbon neutrality goal and promised that building an electric train was among his administration’s highest priorities. In April, Gutiérrez said this goal has not changed, but that MINAE is exploring other options as well. In reality, it’s not just transport systems that are on the table, but the carbon neutrality goal itself. Costa Rica’s current government is assessing whether it’s even possible to make the 2021 deadline. Such an announcement would surely put a damper on this year’s 100 percent renewable start.